It’s early January, so everyone is on a health kick. However, for many, it’s also the first day back to work after a long and wonderful festive holiday. And when you down tools at the end of what feels like the longest day ever, what do you crave? Comfort food is my guess – I certainly did today. And when I walked past the fish and chip shop on the way home, it was as though it was calling out to me. But I resisted, because I knew I had some delicious ingredients lined up for this lovely meal at home. It’s basically got all of the ingredients of fish, chips and mushy peas, so it tastes great, and it’s just that little bit better for you, so you can eat it and feel (a little) angelic at the same time! This will serve 2 (the peas and potatoes are enough for 4, but as usual we’ll have the leftovers for lunch as a glorified potato salad. You can easily expand it to serve 4 by increasing the amount of fish), and will take about 30 minutes to make. This recipe is also part of my Cheap Eats project. 1. For the potatoes, put a large pan of water on to boil. Halve any large potatoes and add them all to the pan, put a lid on and simmer over a medium heat for 15-20 minutes. When cooked, drain and add the butter and parsley. Mix well. 2. For the peas, tip the pancetta into a saucepan. Cook over a high heat until they start to crisp, then add the chopped onion and turn the heat down to medium. After 2 minutes, tip in the wine, if using, and allow to boil down. Then tip in the cream and peas and cook for another 3-4 minutes, until the peas are cooked. Season with salt and pepper. 3. For the fish, heat the oil in a frying pan. Season the fish with a little salt and pepper and dust with the flour. When the oil is hot, add the fish and cook for about 3 minutes on each side, until golden and flaky. 4. 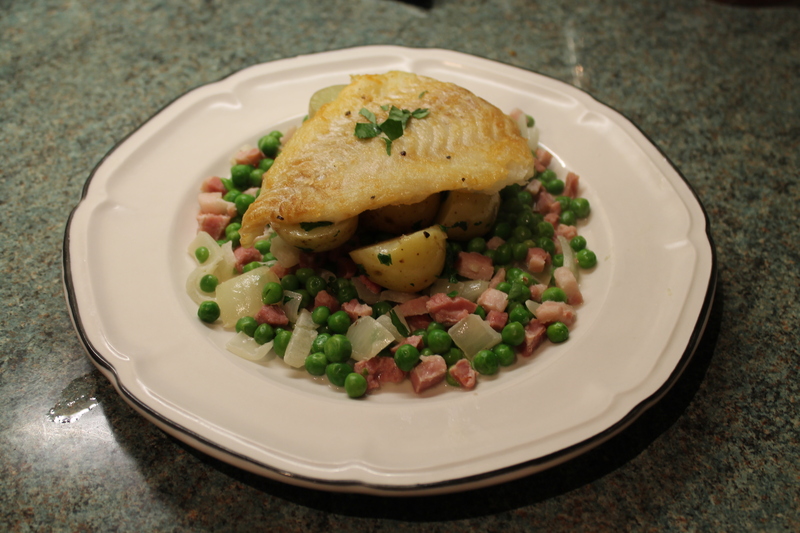 Serve a portion of the fish with a mountain of potato and a mound of peas. Enjoy! Adoring your phrasing “luxury peas” :))) So worthy!